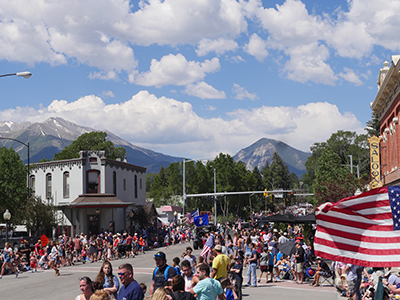 Join us in Buena Vista, Colorado for a spectacular 4th of July Celebration! Our Independence Day includes present day allure with past day charm. We have something to please everyone in the family starting with a Optimist Pancake Breakfast at 7:00 am, Independence Freedom 5K, Art in the Park from 9:00 am to 3:00 pm, Patriotic Parade at 10:00 am, Kids Games and Live Music at McPhelemy Park. In the evening (as long as there is not a fire ban) enjoy American Legion Fireworks! We have much more to share and do please check back for updates and more details. Come early or stay late! We have our Farmers Market on June 30th and July 7th. June 28th – 30th enjoy The Rapids & Grass Beer Fest and June 30th Ivy Ballroom After Party. June 29th brings the East Main Street Events; Mountain Mania Car Show and Homestead Days at Watershed. July 5th offers Free Concert at the Beach and a Classic Car Meet. 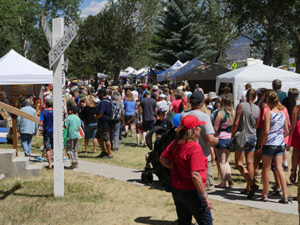 On July 8th join in on Chaffee County Quilts of Valor. Or, visit our Historic Comanche Drive In Theatre 3 miles West on Hwy 306. Spectators – The parade will start at 10 am on Wednesday, July 4th. 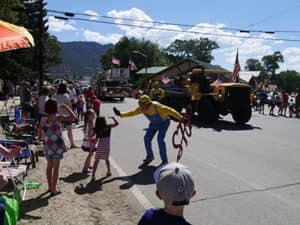 It is on Main Street in downtown Buena Vista, Colorado, starting at the end of East Main St. and proceeding west along Main St. (across Hwy 24) to San Juan St. Bring your chair, bags for the kiddos to collect candy and water! Afterwards enjoy the Art in the Park and all sorts of music, food and shopping venues on East and South Main Streets. 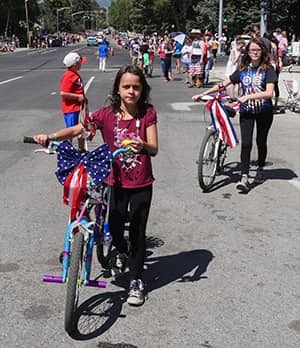 Kids are encouraged to decorate their pets or bikes and join the 4th of July Parade. The three best bikes and three best pets will receive 10.00 dollars each and a ribbon. It is preferred that you register so we know you are coming click here. Must have your parents sign a release form click here for the form. 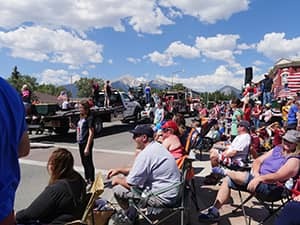 Businesses, organizations or community members are asked to enter a float, or walking display in our 4th of July Parade! Click here to register it is free. – There is no registration fee, donations are kindly accepted for this non-profit event – click here to donate. You must sign and turn in a release at the beginning of the parade to participate. Please sign a release form when you complete your online registration – click here. – Please decorate your float, vehicle, bike, or your walking self so that you can share in the festivities. – No racing car engines or unsafe practices while in the parade. Parade Participants Queue from 9:00 am and 9:30 am – Pick up Number & Directions in front Avery Parsons Elementary School (this is important so that the announcers can properly announce your participation.. Please come as a group if you want to be in parade as a group. Sign up with your own booth for ART in the PARK. Please click here for application, map and waiver form all must be received for complete registration. To purchase your booth click here for ticket. Where: McPhelemy Park intersection of Hwy 24 and Main Street. The 4th of July parade ends at the park! Fireworks: Each year the American Legion puts on a spectacular fireworks display. This is always pending that there are no fire bans in our area. Donation: Please consider donating to the American Legion (goes directly to them) even a $1.00 is helpful. click here to donate.